Bruno Latour is among the most important figures in contemporary philosophy and social science. His ethnographic studies have revolutionized our understanding of areas as diverse as science, law, politics and religion. To facilitate a more realistic understanding of the world, Latour has introduced a radically fresh philosophical terminology and a new approach to social science, ‘Actor-Network Theory’. 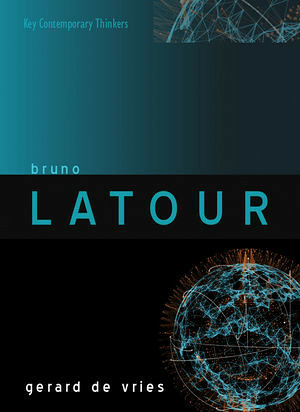 In seminal works such as Laboratory Life, We Have Never Been Modern and An Inquiry into Modes of Existence, Latour has outlined an alternative to the foundational categories of ‘modern’ western thought Ð particularly its distinction between society and nature Ð that has major consequences for our understanding of the ecological crisis and of the role of science in democratic societies. Latour’s ‘empirical philosophy’ has evolved considerably over the past four decades. In this lucid and compelling book, Gerard de Vries provides one of the first overviews of Latour’s work. He guides readers through Latour’s main publications, from his early ethnographies to his more recent philosophical works, showing with considerable skill how Latour’s ideas have developed. This book will be of great value to students and scholars attempting to come to terms with the immense challenge posed by Latour’s thought. It will be of interest to those studying philosophy, anthropology, sociology, science and technology studies, and almost all other branches of the social sciences and humanities.